Growing up among artists, Camila wrote a series of short stories during her kindergarten years followed by a longer story about a black unicorn at the age of 6. Ever since then she has been relying on creative writing assignments to raise her language grade. She started writing French poetry in middle school inspired by by Jacques Prévert’s works and then moved on to Spanish free-verse inspired by Neruda. In 8th and 9th grade she was part of the literary magazine The Fridge at the Lycée Français de New York and in the summer of 2011 she attended a Creative Writing course at Columbia University. She was also an intern at the Stowe Reporter in Vermont, newspaper in which she got a movie review and an opinion column published. When she arrived at ASF, the lack of a prominent literary magazine immediately caught her attention. She has never gone for more than one month without writing. 1. 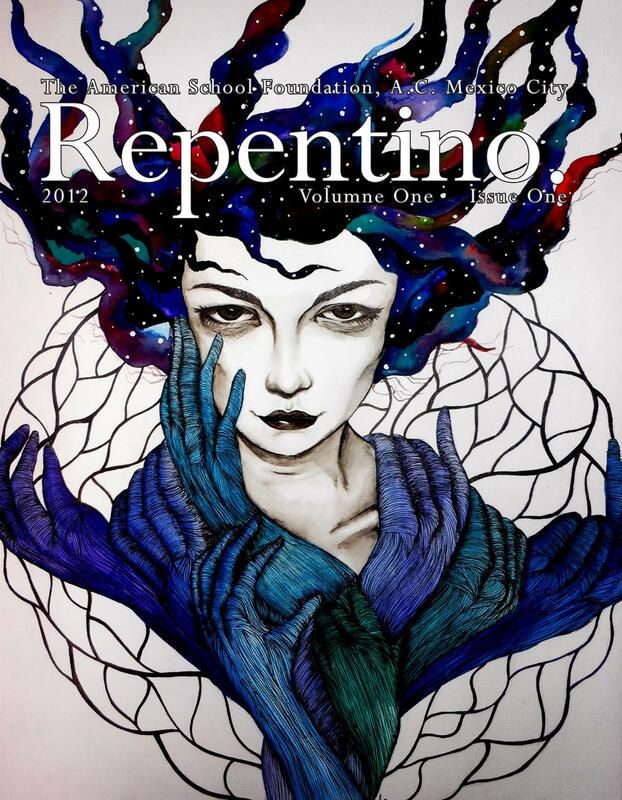 What inspired you to create Repentino Magazine? There are a lot of very talented people out there in the world. However these individuals tend to go unnoticed. I’ve been surrounded by talented people that either do not recognize their own talent or simply haven’t had the opportunity to share their work. Hence the idea of creating a magazine in which the emerging artists share their works and get inspired. Repentino is a work of art conformed by several pieces of art; it is sort of a collage. 2. What have been the highlights so far? There are so many! First of all, we were very surprised with the amazing art that was submitted. Every single piece of the magazine portrays the remarkable sensibility of the artists: all pieces are largely innovative. The students’ reaction to Repentino was also a big surprise: we clearly exceeded their expectations. Now we have students from all grades applying to become part of the Repentino staff. Also, traveling to New York City to attend a series of conferences at Columbia University really helped us create such a high quality magazine. Of course there have been many more indeed. 3. Can you tell us a little bit about your own writing practices. Is there a crossover between your editorial and writing projects? I tend to write a lot of free-verse poetry, some short stories and few theatrical pieces. I despise writing essays. My writings usually spring from my darker thoughts and generally uncover my most hidden emotions. Most of the times the language can be rough and have explicit references to concepts that are not welcome in a high school literary magazine. Hence, no, there is absolutely no crossover between my editorial and writing projects. The only thing they have in common is that I strive to make them both unique. 4. Who are your favourite authors/ poets? Who are you reading right now? My favorite poet of all times is Mario Benedetti. His poetry is so intense that sometimes I think it is more like his own blood spilled on the paper instead of just words. I also really enjoy Amélie Nothomb; her thought process is not even close to anything I have seen before. Right now I am in fact reading a book by her, called Diary of a Swallow, which is supposed to be a love story according to her. Personally, I think it is more about a serial killer/hit man that gets inspired by the music of a band called Radiohead. 5. Can you recommend any contemporary Latin American authors or poets in translation for our readers outside of Mexico? I have a bad habit of reading things written by dead people. However, there is a growing poetry movement in the city and I do know some of the young people that drive it. Poet Daniel Malpica and Anaïs Abreu are not very known, yet there is an inverse relationship between their fame and their talent. 6. Finally, what does the future hold for Repentino? Mostly good things, I hope. As this is our first issue, there is only one thing we can do: get even more awesome. I will be graduating in June 2013, but I know that it will continue to be an important part of the ASF community with the great team that we have out together over the past several months.